Want to try Crowd Cow for yourself? Use this link to get one pound of free ground beef with your first purchase. 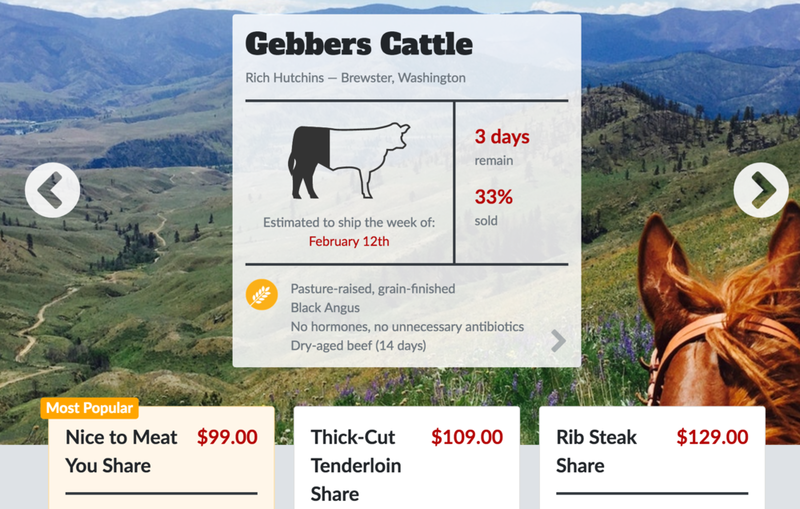 Much like the name suggests, Crowd Cow lets a bunch of customers pitch in and buy parts of a whole cow directly from small family farmers. Only one animal is sold at a time and orders are only processed once all of the parts are claimed. In terms of available parts, you can order everything from top sirloin and New York steaks to soup bones. 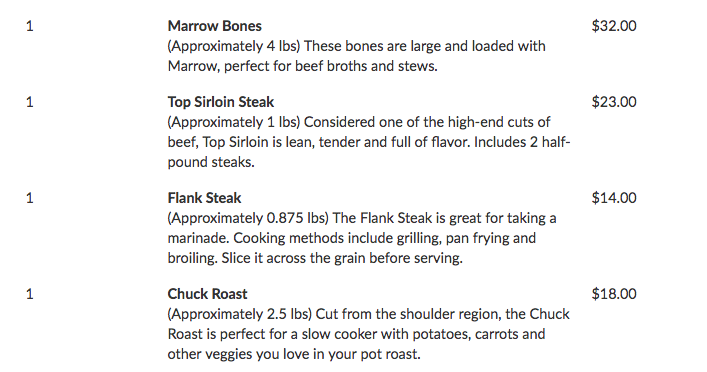 Prices range from upwards of $100 for expensive cuts to $12 for bones. Shipping costs are also added on. Learn more about this Seattle-based startup here. Making an order on Crowd Cow begins with choosing your source. Scroll through the list of about 4 different farms. How you choose the farm is entirely up to you. Some distinguishing characteristics include where the farm is based, cuts of beef still available, and the estimated shipping week. All beef is either 100% grass-fed, grass-finished, or pastured grain-finished beef, and it all comes from small, independent producers. My beef came from Roaring Springs Ranch in southern Oregon. And that is the very first time that I've been able to say exactly where my home-cooked beef has come from! Sample screenshot of the Crowd Cow ordering options on their website. When I had the opportunity to try Crowd Cow, my first reaction was feeling quite overwhelmed by the sheer variety of beef available for purchase. Although I love beef products, I'm by no means an expert when it comes to all of the different cuts. Thankfully, the Crowd Cow website has a whole section dedicated to education. You can not only learn about all the different cuts of beef, but also find recipe ideas. After a bit of deliberation, I ended up ordering the 4 beef items below. For my household of two, I didn't want an excess of beef, so I kept my order as small as possible within the $75 order minimum. I also wanted a variety of cuts that I could use in several different types of dishes. I have a delicious flank steak salad recipe from my mother, plus a constant harrowing for quality bone broth. And finally, I had to sample Crowd Cow's beef in its simplest form, so a couple of top sirloin steaks sounded delicious. As of this moment, the 2.5 chuck roast is still sitting in my freezer as I've had my fill of beef for awhile! After making your order, sit back and wait for a shipping confirmation email and text. Crowd Cow is extra diligent about telling you when your order will arrive. Delivery is made in a big styrofoam cooler. All beef arrives frozen with dry ice, so you don't have to be home to receive the order, but you definitely want to get it into your refrigerator or freezer as soon as possible. Some beef can be cooked directly from its frozen state, but it's best to thaw your beef in the refrigerator the night before use. I opted for the overnight thaw option. The next morning, I got to cooking! The beauty about these particular cuts of beef and the recipes I had planned for them was that they could be phased out over several days. In short: I didn't have to eat a ton of beef all at once. After my beef thawed out, I started with the flank steak. I made a simple teriyaki marinade and let that steak bathe in it overnight with plans to broil it for dinner the following night. Next, the marrow bones got roasted in the oven before going into the Instant Pot to make 2-hour bone broth that was then frozen in ice cube trays for later. Finally, the top sirloin was pan fried for immediate consumption. After a whirlwind evening and a half of cooking and sampling three very different Crowd Cow cuts of beef, I was very impressed with the results. As the occasional home cook without a lot of beef knowledge, I found Crowd Cow's beef to be tender and juicy, and among the most delicious I've ever prepared at home. I especially loved the ability to choose from a wide variety of beef cuts online, rather than being restricted to whatever my local butcher has available when I choose to see him. Plus you can't beat the convenience factor of having the beef delivered to your doorstep! Meanwhile my husband was particularly impressed with knowing exactly where our dinners came from, and knowing that it all came from a single cow. There's something for every type of beef lover at Crowd Cow and I definitely recommend giving it a try if you're at all curious. Don't forget to use this link for a freebie with your first order! See my Crowd Cow photo gallery here. This is a recipe perfected by my mother, Cyndy Pratt. I remember eating this flank steak sometimes over hot rice, or mixed into a salad the next day if there were leftovers. This was one of those meals that I looked forward to on a regular basis. I'm delighted to report that my attempt at making it turned out just as delicious as my memories of enjoying it as a child. In a mixing bowl, combine steak marinade ingredients (soy sauce, sherry, sesame oil, sugar, ginger root, and garlic). Place steak in a flat glass or ceramic pan. Pour mixed marinade over the steak. Cover with plastic wrap. Refrigerate for several hours, or overnight. Broil the steak in the oven to medium rare. Let sit for 10 minutes before slicing very thinly against the grain. Prepare the salad by washing salad greens and making the salad dressing (mix all ingredients above). Assemble salad with flank steak slices. Toss and serve! Bone broth is all the rage thanks to primal and paleo diets. But besides its nutritional benefits, homemade bone broth is great to have around the house for enhancing soup recipes, especially during the colder months. You can make bone broth using a big stock pot sitting overnight on your kitchen burner. Or you can reduce the time significantly by using the ever-popular Instant Pot pressure cooker. As a bonus, the Instant Pot is great for making other soups using this bone broth in the future! This recipe is based off of the one provided by Amy and Jacky of Pressure Cooker Recipes. 2 celery stalks, diced <-- I forgot these in my own recipe! 1. Add marrow bones, onions, carrots, and celery to an oven-safe dish. Roast for 25-30 minutes at 375°F. This makes your broth darker with a roasted flavor. 2. 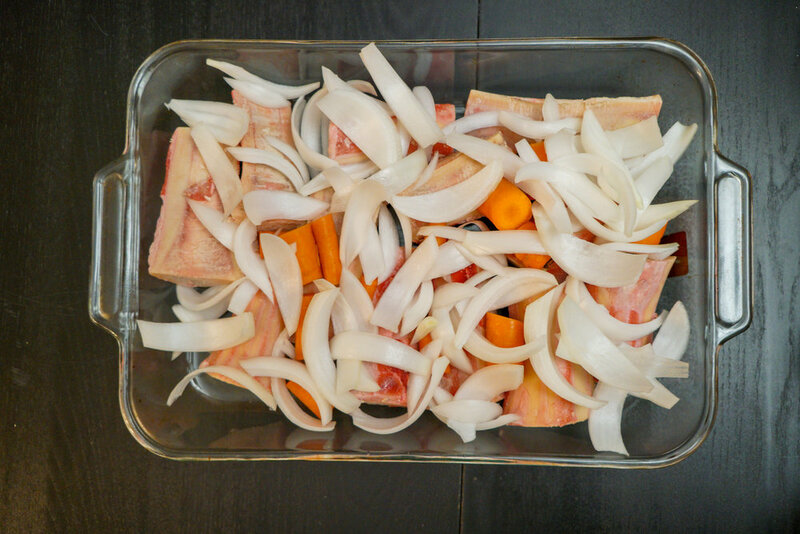 Open Instant Pot and add roasted bones, onions, carrots, and celery. Add the rest of the ingredients. Close lid and set the Instant Pot to Manual, High Pressure for 2 hours (120 minutes). After cooking, allow for about 45 minutes of Natural Pressure Release (NPR). 3. Open lid carefully. Allow the broth to cool. 4. Enjoy as-is, or freeze for later in ice cube trays. 1. Use paper towels to dry steaks. 2. Rub steaks with oil, salt and pepper. 3. Heat a skillet to medium high. 4. Cook steaks on hot skillet for about 3-5 minutes on each side. 5. Let steaks rest for 10 minutes before serving.